GAC Motor, one of China’s biggest auto manufacturers, is looking to break into the American market this year. 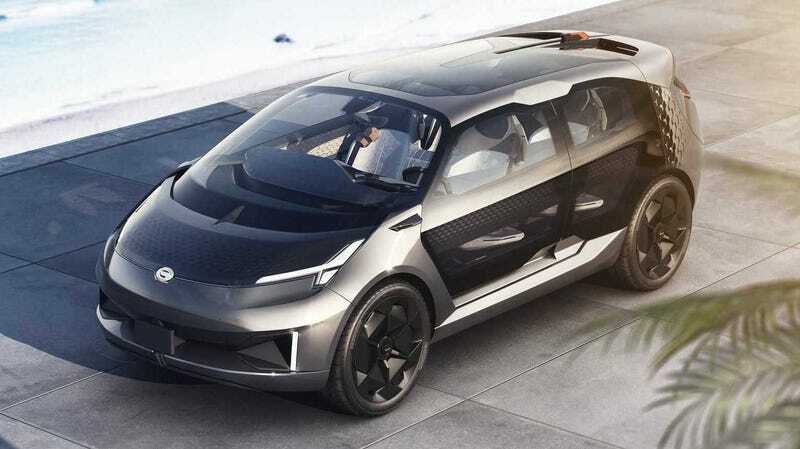 When it announced a new EV concept for this year’s Detroit Auto Show—the Entranze—it could only be with the intention of making a big splash. And with an innovative interior design centered around environmentally sustainable materials, they may do just that. GAC has had a sizable presence at the Detroit Auto Show for the past few years, showing off a range of SUVs, sedans and minivans to American shoppers, even though its vehicles aren’t for sale here yet. That could well change this year, however, and this concept is meant to showcase the company’s ambitions and technology. The Entranze is a seven-seater half-van half-SUV crossover—with something of a twist. While many of our seven-seaters here in the States are a 2+2+3 configuration, GAC is debuting a 3+2+2 configuration. That’s right, baby. Bench seats are back! GAC is calling the Entranze a “hyper-modern family vehicle” and the “ultimate road trip car”. With everything from a vaguely defined enhanced ergonomics system to an electric powertrain to two OLED screens in the dashboard as opposed to one, GAC is trying to make this a car that you feel good about driving. See, they’ve incorporated a ton of environmentally-friendly materials in the interior—things like cork—to make the Entranze a truly remarkable feat of design. Creating zero-emissions EVs is one thing. Making sure those vehicles are made of sustainable materials is entirely another. And the press release makes it out to be very user friendly: rocker panels can be used as steps, it’s autopilot ready, it has a storage trolley that can be stored between seats, the windows are sliding panels that can break the barrier between indoors and out, and it’s spacious. The Entranze was designed by GAC Executive Design Director Pontus Fontaeus at the automaker’s Los Angeles design center—GAC’s first vehicle ever designed there. Fontaeus has an impressive resumé, having done design work for manufacturers like Volvo, Ferrari, Kia, and Faraday Future. Designing a sustainable car intended to break into the American market from an entirely foreign maker may be one of his most ambitious projects yet. Before you get too excited, remember that the Entranze concept is just that: a concept. GAC has been pretty tight-lipped about the exact specs or production of this thing, specifically regarding its powertrain. The press release mentions that it doesn’t have a traditional front-engine powertrain and is thus unconstrained by traditional engineering, but it doesn’t offer many specifics about what that’s supposed to mean. Still, if GAC is looking to make a big splash stateside, something creative like the Entranze could be the way to go. With added sustainability features and a luxe exterior, GAC might have just found its niche. Despite the goofy name and obvious concept-car vaguery, the Entranze is a well-thought out concept, and is a pretty good basic design. There’s a lot of novel thinking here, from the fold-down rocker panels designed to convert to benches to the dual, opposite-direction sliding doors. The interior space is very well considered and this actually would make a great road-trip vehicle, if it actually existed. I suspect people would want more privacy than those transparent sides provide, but that seems like something easy to resolve in a similar production vehicle. Overall, this is a well-thought out concept; I’m curious to see if it actually leads to any influence in production vehicles, which is by far the hardest part of these things. At 2018's Detroit show the company announced it planned to start selling cars in the U.S. by 2019 and it’s trying to recruit American dealers to do exactly that. But one thing that could throw a wrench into the whole affair is the possible trade war between the U.S. and China. Though talks remain underway until a March 1 deadline and decisions seem to change almost weekly, America’s planned 25 percent tariff on finished vehicles built in China could undercut GAC’s value proposition in the market, or delay its entry entirely. As Automotive News also reports, GAC has chosen Irvine, California as its U.S. base for now, to do sales, marketing, finance and product planning. It’s also opening an R&D center in Michigan. We’ll see what happens with the tariffs, but this company is very poised to break into America soon.